Persian shield growing shrub of the genus Strobilanthes also known as Strobilanthes dyerianus, Persian shield perennial evergreen used as ornamental plant (can be grown in cold temperature as annual, can grow in tropics, mediterranean, subtropics or temperate climate and growing in hardiness zone 10+ as perennial and 4-10a annual. Leaves color purple with green blue in stripes, the shape is elliptic. Flower color purple in cone shape little bit like trumpet and grow spike. 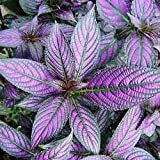 LIVE PLANTS Persian Shield, Strobilanthes, Exotic, gorgeous live plants, iridescent purple and silver leaves. Grows to 5 feet. 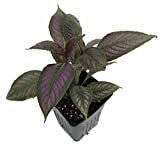 PERSIAN SHIELD 'STROBILANTHES DYERIANUS': LIVE PLANT: 20-25 TALL: 1 GALLON POT!